In a free society, lines or queues are temporary; for they strongly indicate an exceptional market demand which businessmen will scramble to meet. So if a queue persists, it forms a signal that the non-market entity called government is interfering. And none are more persistent than at the border between one tax farm and its neighbor. Whether by the TSA going out or the CBP coming in, waiting to be examined by a FedGov goon at one of America's gates gives one ample time to reflect on the nature of simple queuing theory, and I took that chance recently at Logan. So, if a toll operator can take a buck from 100 cars an hour (36 seconds each) and 25 cars turn up at random intervals in an hour, what's the delay? u is 25% or 0.25, so u2 is 0.0625 and (1-u) is 0.75, so d is 0.0625 / .75, or 0.0833 times the 36 seconds he takes, which is 3 seconds. Not bad but, surprisingly, not zero. 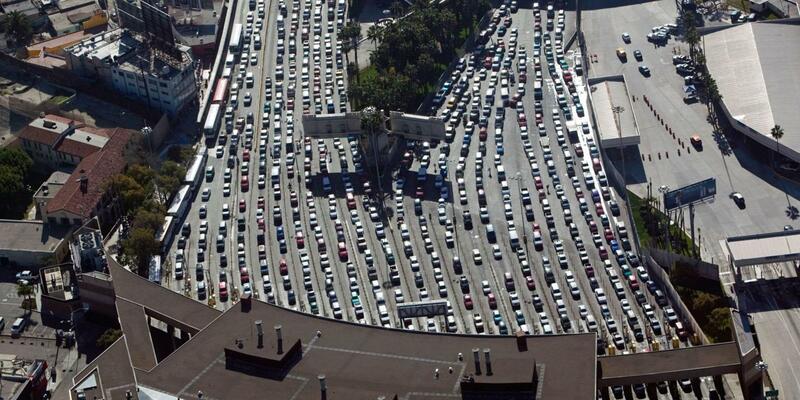 Now presume the usage rises to 75 cars an hour; d becomes 2.25; and since 2.25 x 36 is 81, you wait 81 seconds in line! At Logan, I noticed that travelers were detained for about 5 minutes each once they reached an agent of the CBP, but that the wait to reach him for everyone was about one hour. So, 60 / 5 being 12, we know d = 12. Everyone stood in line for 12 times longer than the actual legislated work took. What was u? Since u2/(1-u) = 12, we have u2 + 12u - 12 = 0 and by this handy quadratic solver, u = 0.928 or 92.8% occupied. My, those thugs with uniforms, badges and guns sure are busy... even though none of them appeared to be in any hurry. How might this outrageous, aggravating delay imposed upon tired travelers American and otherwise be reduced? - there are several ways. One, the CBP could hire more agents. I noticed that only about half of the available gates were actually staffed, so if they were all occupied the usage would fall from 92.8% to 46.4%, or u = 0.464; what than would happen to the 1-hour wait? d = 0.4642 / 0.536 = 0.402; the wait would fall to only 40.2% of the 5 minutes the clerical nonsense actually takes at the gate, or 2 minutes. From 60 to 2; a 30-fold improvement. Not bad! Surprising, that nobody in the CBP has thought of that, since everyone in government favors increasing the level of staffing. Not that I recommend it, of course, I just point out the facts. Or two, Commissioner McAleenan could direct that his agents get off their backsides and increase the speed at which they labor, as a condition of remaining one of his 12,000 employees. That would for sure be possible, and the 5 minutes per traveler might be cut to 2 or 3. If, say, it fell to 2.5 then the effect on that 1-hour wait would be the same as above, it would be slashed to a delay of 2 minutes. One of those two fixes is common abroad; in Germany for example there's a quick scan of the passport, a gaze at the face and at its photo, a polite "Danke" and you're on your way. Half a minute at the gate, preceded by a wait of a similar duration. Or three, the Customs and Border Protection outfit could go out of business, which is what is going to happen after the zero government society begins for real. Anyone wishing to travel anywhere will be free to do so, at his own expense and risk of course; and if he is met at the crossing from a country where a government still remains, the greeters will be offering him some helpful service (for a fee) such as a taxi or train ride or a hotel room. How likely is it that the good Commissioner, or his boss at the White House, will take that very sensible third option? - about the same as a snowball's chance in hell. Howls will be heard about letting in criminals and drugs and terrorists. Won't all that ruin the coming ZGS? Not exactly. There may be some kriminals entering the Former USA, but they will not find work congenial. Everyone who so wishes will defend themselves with a well-controlled gun, and the justice system will be efficient, unlike today. And once a reputation for honest dealing is lost, it will be a real grind to get it back. No, kriminals will find better pickings elsewhere. As for drugs, yes; if importers can satisfy a customer demand not being met by domestic producers, in they will come. So? And as for terrorists, whom exactly would they want to terrorize, and to what end? The motive now is to intimidate the FedGov into changing its foreign policy; to get its forces out of Muslim lands, to stop supporting Israel, to quit badgering Russia with sanctions, to end "aid" to oppressive African dictators, etc. But there will not be any single foreign policy in the ZGS, nor any government to carry it out. So there will be nothing to protest, and therefore no terrorists. Now, since the CBP won't put itself out of business, we have to gently do it for them. The uniformed, overpaid thugs are getting their kicks by intimidating travelers, so they won't quit until that job satisfaction comes to an end. How can that be done? - it's at this point that libertarian folk divide. Some say it cannot be done, the task is impossible, or that it will take centuries. To those, I pose the question "What, then, are you doing here, wasting your time on an impossible dream?" Others, like me, say that it certainly can be done, and that right early. If you have a better idea I'd love to hear it, but in my LRC article The Fix I outlined a method that is quick, peaceful and effective.